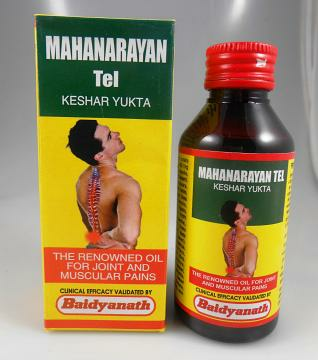 The Renowned Oil for joint and muscular Pains, Ayurvedic Granthokta Medicine Keshar yukta. Helps to relieve joint pain, backache, pain in the ribs, groin and calf injuries etc. Helps to strengthens muscles and bones. pain in any part of the body ect. Massage with this oil strengthens muscles and bones. Gently massage the affected part with this oil Fomentation recommended. Buy Baidyanath Mahanarayan Tel Oil Joint & Muscular Pains Natural Herbel, sold & shipped by Mahavir Wholesale where you can shop online for Grocery Products of India - Patanjali, Chai, Henna & Beauty Items.